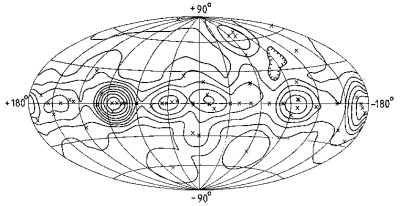 Approximate sky exposure between 17 August 1975 and 25 April 1982 (galactic coordinates). The contour intervals are in 32-day steps, the lowest being 8 days. Crosses indicate pointing directions. The satellite was operated in a pointing mode with its spin axis directed towards fixed points in the sky for periods of four to five weeks early in the mission and up to 3 months in later observations. In total 64 observations (or pointings) were made: the sky coverage achieved in this way is shown in the figure above. A broad band along the galactic equator was studied deeply, by means of repeated or overlapped observations. The telescope performed well throughout the mission: the only complication being due to occasional erratic performance of the spark chamber and the inevitable reduction in performance as the spark chamber gas aged. This ageing was, however, minimised by means of a gas-replenishment system to permit emptying and refilling of the spark chamber. As the rate of gas deterioration decreased with time, it proved possible to increase the interval between flushing from its initial value of 6 weeks to about 36 weeks before the final flushing in November 1981. The spark chamber was still performing creditably at the end of the mission in spring 1982. The end of the mission coincided with the end of available attitude gas, which had been conserved by careful choice of manoeuvres.